The Role of Surgery in the Management of Infantile Hemangiomas: What is the Best Timing? This issue of Otolaryngologic Clinics, guest edited by Drs. Teresa M. O and Milton Waner, is devoted to Congenital Vascular Lesions of the Head and Neck. 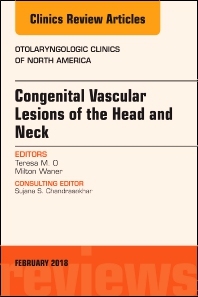 Articles in this issue include: Classification and Pathology of Congenital Vascular Anomalies of the Head and Neck; Etiology and Genetics of Congenital Vascular Lesions; Radiological Evaluation of Congenital Vascular Anomalies; Congenital Vascular Tumors; The Role of Surgery in the Management of Infantile Hemangiomas; The Management of Airway Infantile Hemangiomas; Multidisciplinary Approach to the Management of Lymphatic Malformations of the Head and Neck; New Frontiers in Our Understanding of Lymphatic Malformations of the Head and Neck; Venous Malformations of the Head and Neck; Capillary Malformations of the Head and Neck; Arteriovenous Malformations of the Head and Neck; The Management of Vascular Malformations of the Airway; Role of Neurophysiological Monitoring in the Surgical Management of Congenital Vascular Lesions of the Head and Neck; Acquired Vascular Tumors of the Head and Neck; Orthognathic and Dental Considerations; Hereditary Hemorrhagic Telangiectasia; and Psychosocial Impact of Living with a Facial Vascular Lesion.